This perhaps still bears repeating, although it’s close to becoming common knowledge. Summertime is no longer a throwaway bin for misfit scripted series on ABC, CBS, NBC and Fox. Further proof arrives on Monday, June 1st, when ABC launches its last new series originally announced in May 2014. It’s The Whispers, a compelling paranormal suspense hour in which the kids aren’t all right while the adults strive to divine what’s driving them. ABC made the first three hours available for review. Affixed with a Steven Spielberg co-executive producer credit, they’re well-paced, intriguingly plotted and rich in possibilities. It also helps that series lead Lily Rabe is instantly relatable as traumatized FBI agent/child specialist Claire Bennigan. She’s been on an open-ended leave of absence ever since her military pilot husband died in a plane crash and their little son, Henry (Kyle Harrison Breitkopf), lost his hearing. Or did they? Complicating matters is the affair Claire had with Defense department dude Wes Lawrence (Barry Sloane), whose wife, Lena (Kristen Connolly), is painfully aware of this. The Lawrences also have a kid named Minx (Kylie Rogers), who’s been taking orders from a not-so-imaginary friend known as “Drill.” Another pre-teen, Harper Weil (Abby Ryder Fortson), likewise is under Drill’s spell. What happens to her mother early in Monday’s premiere is clear evidence that this is no benign Mr. Snuffleupagus. The other central character, played by Milo Ventimiglia, is a bearded, wild-eyed instrument of mayhem whose identity becomes known before these first three episodes run their course. But “John Doe” himself doesn’t know who he is -- or what’s directing his actions. Saying too much more would be spoiling this broth. So let’s just say that Rabe contributes a standout lead character while the three major kiddos (so far) all seem comfortable and natural on camera, whether communicating with Drill or their parental units. Spielberg has always had a facility for casting children and a fondness for the supernatural. 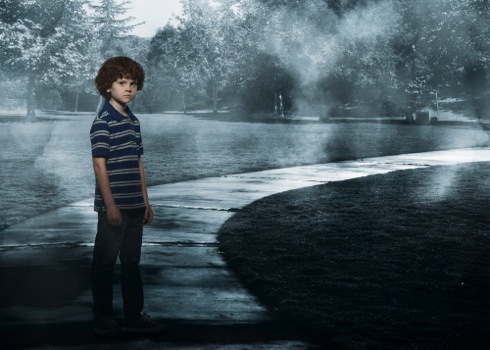 In The Whispers he also gets the adult mix right in a bracingly good and shivery serial drama with much to show and tell in the first three hours.